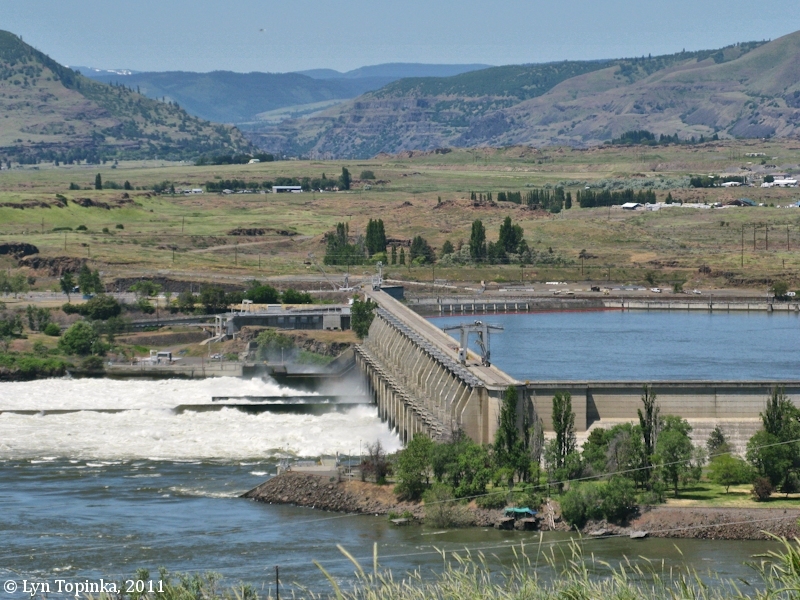 The Dalles Dam is located in the Columbia River at River Mile (RM) 191.5, at the foot of the (now flooded) "Short Narrows" or "Fivemile Rapids". 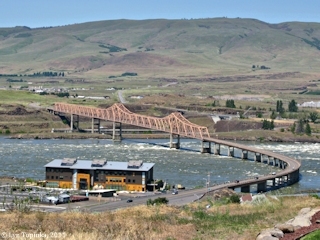 Less than half a mile downstream from The Dalles Dam is The Dalles Bridge (U.S. Highway 197) connecting The Dalles, Oregon, with Dallesport and Murdock in Washington. 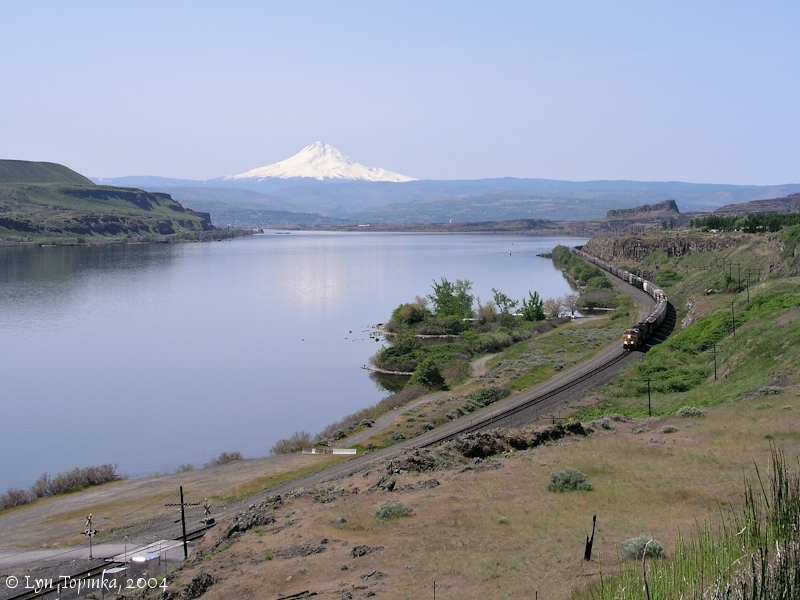 Two miles downstream from the Dam on the Oregon side is Rock Fort, Lewis and Clark's campsite of October 25-27, 1805 and again April 15-17, 1806. One mile upstream on the Washington side is Spearfish Lake, where Lewis and Clark spent the night of April 18, 1806. The dam was completed in 1957. It extends one and 1/2 miles from the Oregon shore to the navigation lock on the Washington shore. Because the boundary between the two states follows the old river channel, The Dalles Dam is almost entirely in the state of Washington. 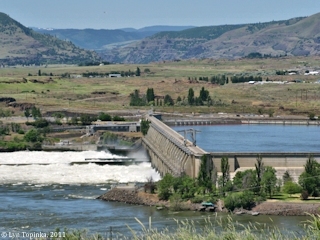 The dam complex consists of a navigation lock, 1,380-foot-long spillway, 23 gates, powerhouse and fish passage facilities. 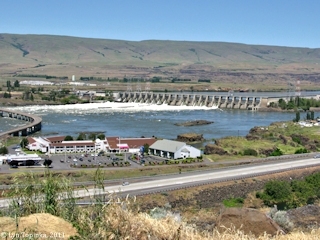 The filling of Lake Celilo inundated Celilo Falls and the famous "Long" (Fivemile Rapids) and "Short Narrows" (Tenmile Rapids). Click image to enlarge Before the building of the Dam ... NOAA Chart #6157 detail, The Dalles-Celilo Canal and Locks. 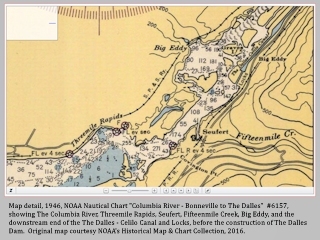 Original map courtesy NOAA's Historical Map & Chart Collection, 2016. 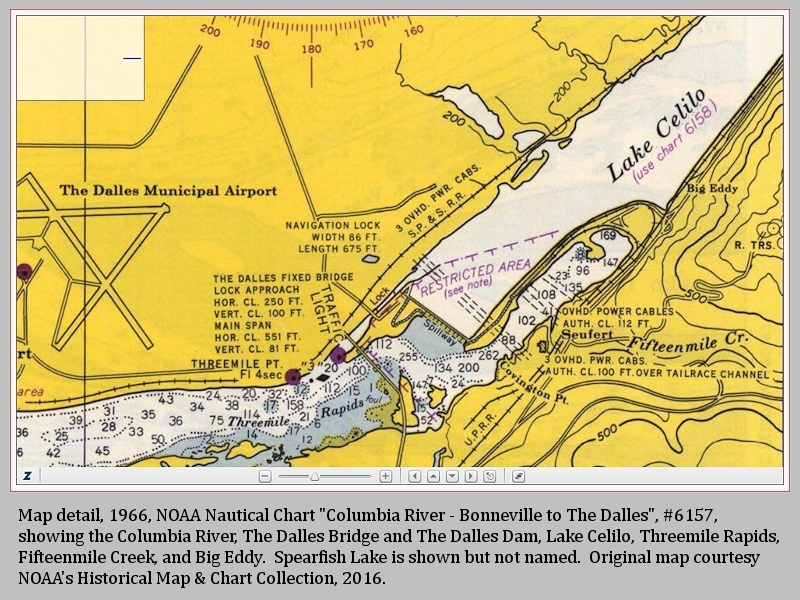 Click image to enlarge After the building of the Dam ... NOAA Chart #6157 detail, The Dalles Dam and Lake Celilo. 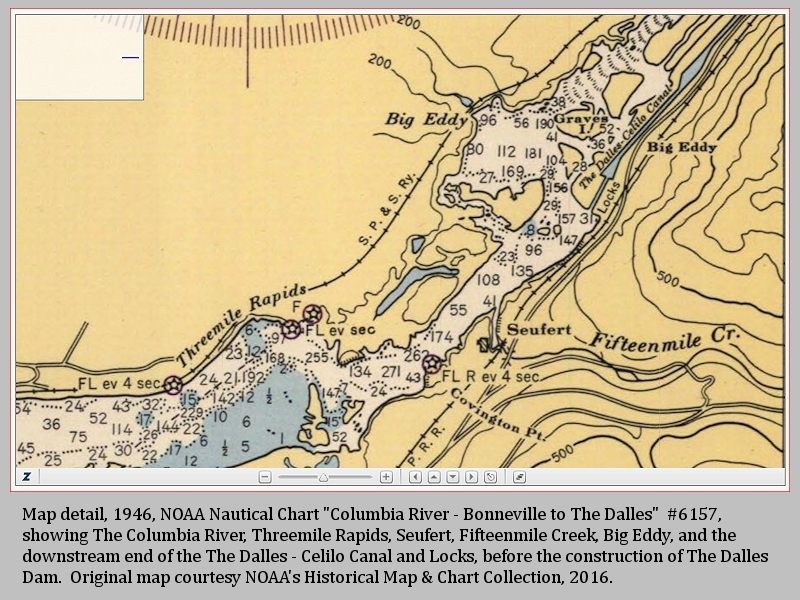 Original map courtesy NOAA's Historical Map & Chart Collection, 2016. 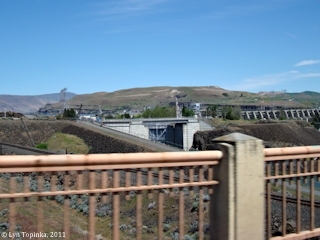 Click image to enlarge The Dalles Bridge and The Dalles Dam. Once this was the location of a ferry across the Columbia. View from hills above The Dalles, Oregon. Image taken June 4, 2011. Click image to enlarge The Dalles Navigation Lock, The Dalles Dam, The Dalles, Oregon. View from moving car on Interstate 197 Bridge. Image taken October 6, 2011. 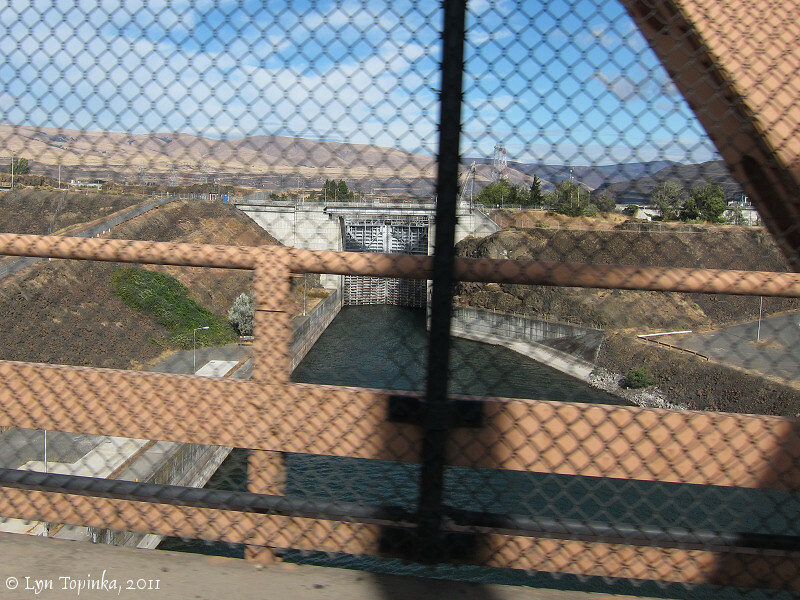 Click image to enlarge The Dalles Navigation Lock, The Dalles Dam, The Dalles, Oregon. View from moving car on Interstate 197 Bridge. Image taken June 4, 2011. 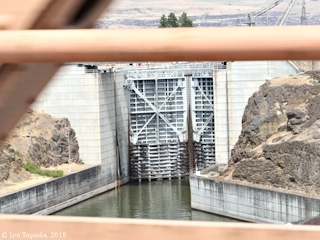 Click image to enlarge The Dalles Navigation Lock, The Dalles Dam, The Dalles, Oregon. View from moving car on Interstate 197 Bridge. Image taken June 6, 2018. 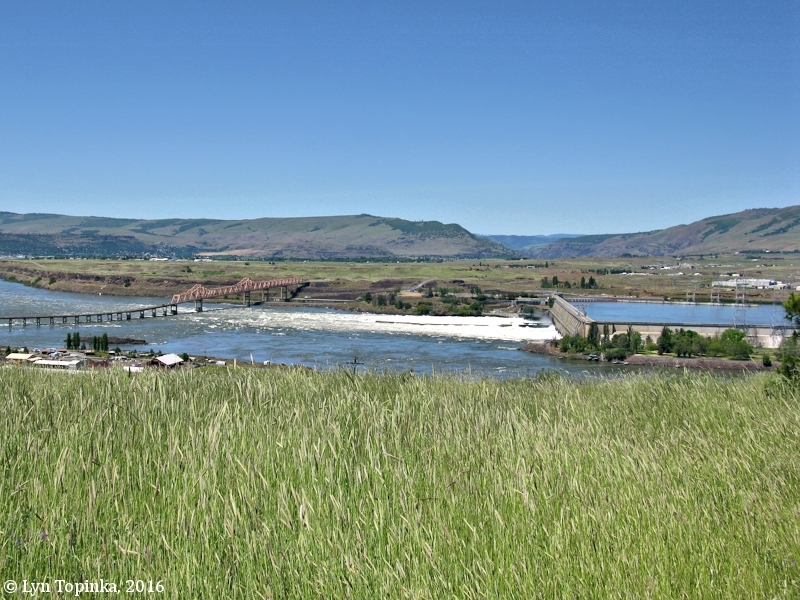 In 1957, with the construction of The Dalles Dam, Celilo Falls forever disappeared. 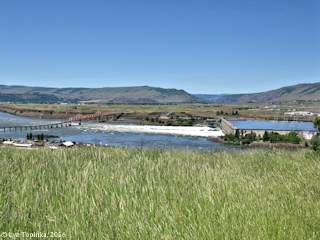 Lake Celilo is the 24-mile-long impoundment behind the The Dalles Dam. 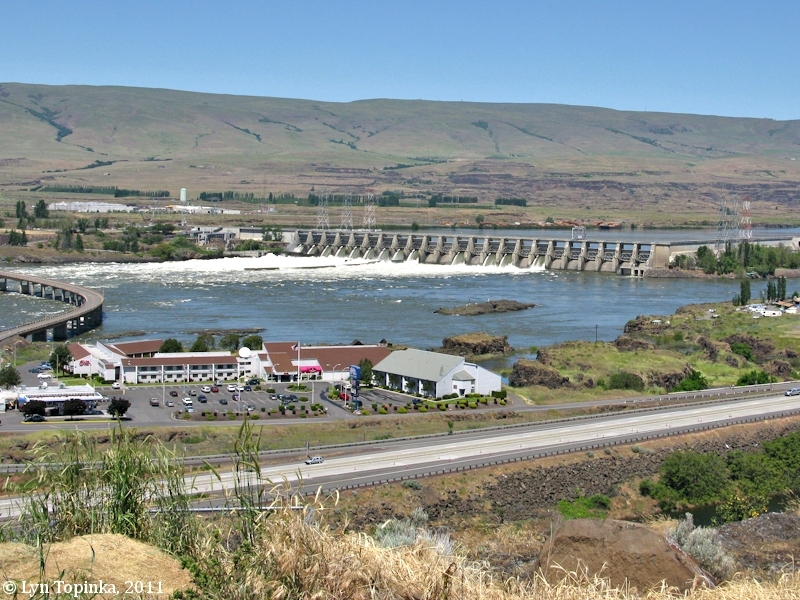 The Dalles Dam was completed in 1957, and the rising waters of Lake Celilo inundated Celilo Falls, plus the "Long" (Fivemile Rapids) and "Short Narrows" (Tenmile Rapids). 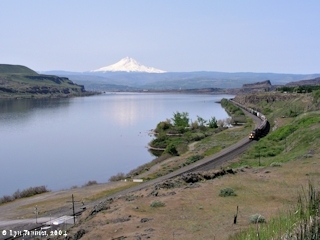 Less than half a mile downstream from The Dalles Dam is The Dalles Bridge (U.S. Highway 197) connecting The Dalles, Oregon, with Dallesport and Murdock in Washington State. 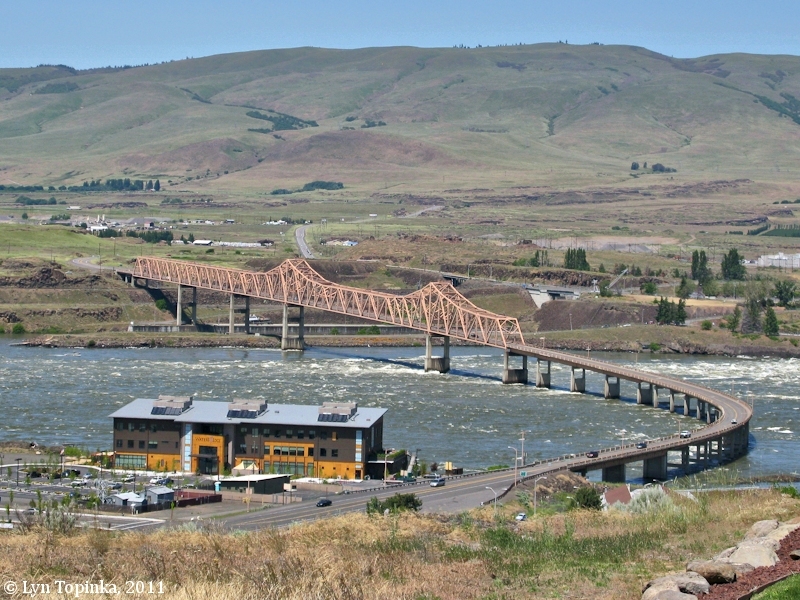 The historic The Dalles - Celilo Canal was completed in 1915, creating a steamboat waterway around the Fivemile Rapids ("Long Narrows"), Tenmile Rapids ("Short Narrows"), and Celilo Falls. It provided a clear journey to Lewiston, Idaho. 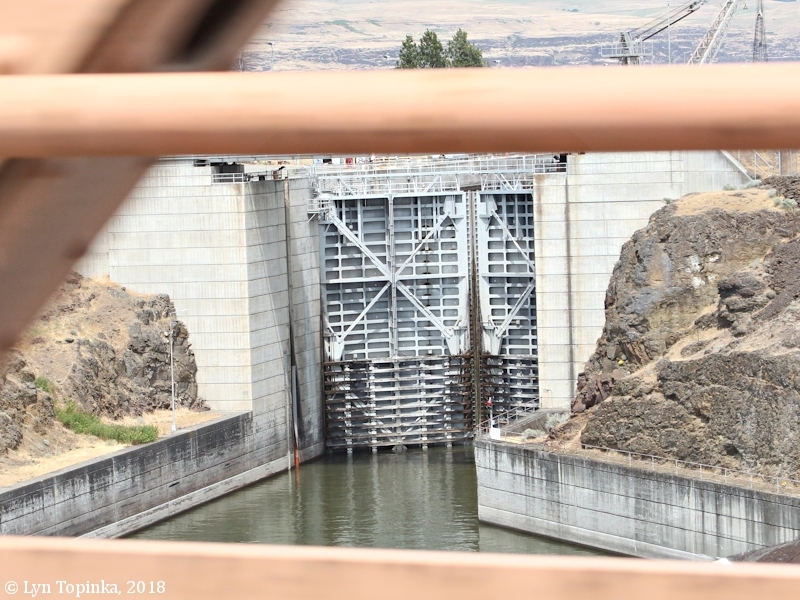 The canal was 8.6 miles long with it's lower end located 3.3 miles above The Dalles The demise of the canal came in 1957 with construction of The Dalles Dam and Locks.